What makes it Environmentally Responsible? 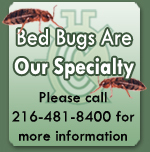 Cleveland Chemical Pest Control's new Sentricon* Termite Colony Elimination System not only does away with termites much more efficiently than previous methods but also eliminates the mess. The only part of the Monitor/Treatment unit that can be seen above ground is the cap, and it closely resembles the heads of an underground sprinkler system. The same unit is used to detect the presence of termites and treat them once discovered.